ENGAGED! Drinking wine from this libbey glass may cause one to share the excitement of your engagement! This wine glass is the perfect choice after a long, rough day or a humorous start to enjoying a drink with friends. This wine glass quote will ring true with most avid Target fans and start a conversation of laughter and jokes. LOL CONVERSATION STARTER! 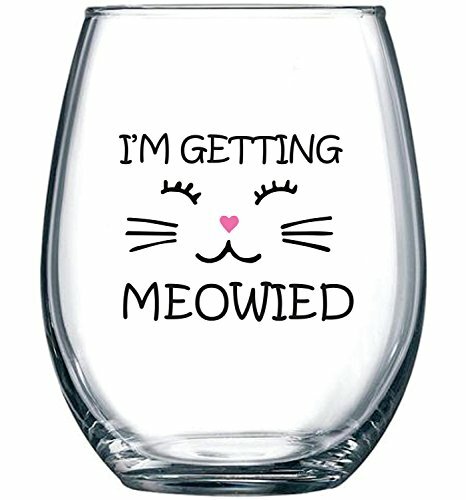 - Enjoy a relaxing evening with your new favorite stemless wine glass, which reads I'm Getting Meowied. Holds 15 ounces of your favorite white or red vino. CAREFULLY PACKAGED - Each Hilarious Wine Glass is carefully packaged in a durable white gift box; guaranteed to arrive safely with free shipping through Amazon Prime.